LOUISVILLE — Following a nearly two-year process that began at the 222nd General Assembly of the Presbyterian Church (U.S.A.) in Portland, Oregon, three groups are gathering April 8–9 to iron out disagreements over a joint recommendation from the Way Forward Commission (WFC) and All Agency Review Committee (AARC) on the corporate organization of the denomination. At question is the “A Corp.,” the corporate entity of the denomination that currently functions as a fiduciary and legal body for the Presbyterian Mission Agency (PMA) and Office of the General Assembly (OGA) agencies of the PC(USA). 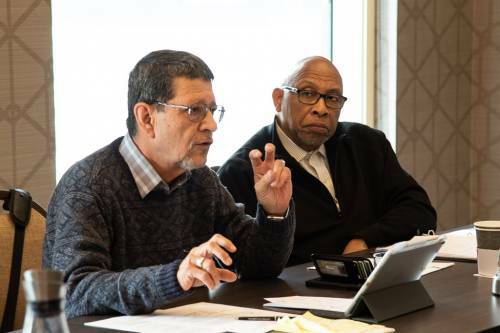 The joint recommendation of the WFC and AARC proposes a separation of the A Corp., removing it from the exclusive control of the Presbyterian Mission Agency Board (PMAB). The proposal provides for input and decision making from other agencies in regard to corporate functions and oversight of shared services utilized by several agencies. The Governance Task Force (GTF) of the PMAB, formed in February 2016, has proposed its own recommendation and expressed concerns over several of the joint recommendation’s finer points. These concerns include the process of nominating board members for the A Corp., financial control of mission funds, and the perception that a separate A Corp. will introduce inefficiencies into the work of the Mission Agency. Held in Louisville and moderated by Heath Rada, Moderator of the 221st General Assembly, representatives of the three groups were joined in their deliberations by Kerri Allen from the Advocacy Committee for Women’s Concerns (ACWC), Thomas Priest from the Advocacy Committee for Racial Ethnic Concerns (ACREC), Carol Winkler from Presbyterian Women (PW), and Stephanie Anthony from the Committee on the General Assembly (COGA) and an advisory delegate to the PMAB. Among the approximately 20 observers of the deliberations were the Rev. Dr. J. Herbert Nelson, II, Stated Clerk of the PC(USA), along with Cynthia Jarvis and Veronica Goines, moderator and vice-moderator of the Way Forward Committee at General Assembly 223 in St. Louis. 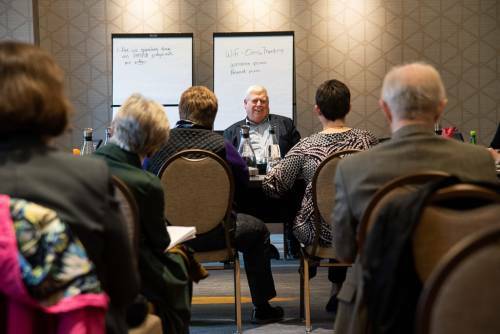 Rada summarized the mandate of the Way Forward Commission, saying it was “to offer a new solution, immediately” to perceived problems in the denominational structure that don’t reflect the needs of the 21st century church. Appeals and disagreements are possible, he said, noting other Assemblies where multiple proposals had been delivered for consideration. “It isn’t a level playing field, but it doesn’t mean we don’t have the right to suggest or implement change,” he said of the Way Forward Commission’s mandate. Melinda Sanders, chair of the PMAB Governance Task Force, read an opening statement in which she commended the work of the WFC and AARC, noting the many commonalities in the groups’ proposals. Several agendas had been proposed by the various groups for this face-to-face meeting, which prompted Rada to seek consensus for an agenda. 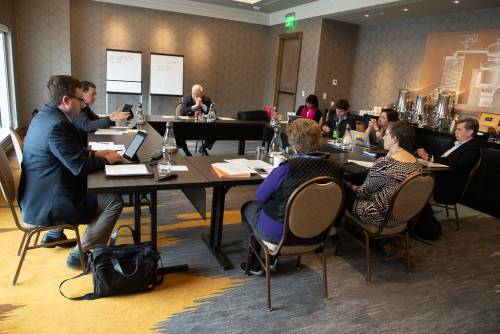 Jim Wilson, speaking for the AARC, led the way in expressing apprehension over what could be accomplished by reviewing already submitted proposals. Before Rocha and Herring could explain the history of the Governance Task Force proposal, Allen asserted the problem with the proposals sent to the Assembly were not in understanding them, rather how they were formed, specifically, she claimed, without input from advocacy and advisory groups. “There is a pretty solid understanding for some of us about the proposals,” said Allen. “It’s not that people don’t understand, it’s that we may disagree. There are legitimate reasons these proposals came to be, legitimate concerns voiced throughout the church. Recommendations that came from the GTF included reducing the board size from 60 to 20, giving board members responsibility in both legal/corporate and mission functions, and disbanding the executive committee so board decision making would be made by the entire body instead of a small group. “It’s been a good model for how we carry out, what I call, responsible change,” Rocha said. “From our perspective, this [A Corp.] board needs a narrow but important skill set to evaluate the best means of delivering shared services — accounting and legal services,” said Wilson. In addition to raising concerns about the readability and timeliness of corporate financial reports, the underutilization of the church office property in Louisville, diversity in board representatives and the professional competencies of board members, the group heard from others invited to the table. She asked how Presbyterian Women’s future could be assured in the A Corp. As the second-largest user of currently provided shared services, she wondered how the autonomy of PW would be assured. Allen asserted that ACWC had not been contacted by the WFC or AARC as they surveyed the concerns of the church. “It’s not a wholly accurate statement to say you talked to all corners of the church,” she said to the members of the two groups. Wilson countered that the AARC had attempted to communicate with the ACWC representative provided by the General Assembly without success. Yet, she said COGA was not consulted by the PMAB on its recommended deliverance to form separate corporations for the PMAB and COGA and the PMAB’s decision to distance itself from providing shared services. Rada offered a summary of the day saying the conversation was honest, there was a desire by all parties to “do church differently,” an acknowledgment that there had been communication lapses but “no intentional exclusion,” and each body present had valid input.